Greetings again from the darkness. 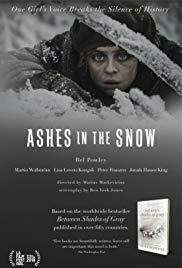 Most World War II films focus on the atrocities committed by Hitler’s German forces, but this adaptation of Ruta Sepetys’ novel (“Between Shades of Gray”) reminds us of the evils under Stalin and the Russian seizure of the Baltic States. Director Marius A Markevicius delivers a feature film debut that is both historical drama and tale of human perseverance. We have long since been educated on just how cruel humans can and have been to other humans, and director Markevicius – with a script from Ben York Jones (LIKE CRAZY, 2011) – doesn’t shy away from the cruelty or atrocities, but he and cinematographer Ramunus Greicius capture the harshness and brutality of the Siberian environment, as well as the brief moments when those being held captive feel sparks of life. Bel Powley (THE DIARY OF A TEENAGE GIRL, 2015) stars as Lina, a young Lithuanian artist who lives with her family: mother Elena (Lisa Loven Kongsli, FORCE MAJEUR) and brother Jonas (Tom Sweet). The father/husband is played by Sam Hazeldine and we learn of his secret agenda and activism later in the film. When Russian troops forcibly remove mother and the two kids from their home, a long train ride ends with their working the fields in the Altai Labor Camp in Siberia. Martin Wallstrom is excellent as Kretzky, a conflicted Russian soldier from the Ukraine. He’s kind of persona non-grata on both sides, and as an outsider to the troops and the “devil” to the prisoners, he is somewhat of a sympathetic character. A year later (1942), the family and Officer Kretzky are shipped off to Laptev Sea in the Arctic Circle. This frozen tundra is no place for human beings and death seems preferable to freezing in misery. When giving the relocation order, Kretzky’s commanding officer calls them “one big happy family in frozen hell”. It’s a great line. An acutely descriptive line. Young Lina’s childhood innocence has been shattered, but she possesses an inner strength that only such miserable circumstances could unveil. She carries on finding brief respites in her art and in fleeting romance with fellow prisoner Andrius (Jonah Hauer-King). There is a story told, a legend really, about a fishing boat and its survivors – the correlation made late in the film. The devastating circumstances and desolate landscape are accompanied aptly by German composer Volker Bertelmann. But let’s face it, war crimes against the innocent are tough to watch even in movie form, and this film, regardless of how expertly it’s crafted, is relentless in bleakness – though heartfelt and sincere. This entry was posted on Thursday, January 10th, 2019 at 8:48 pm and is filed under Drama. You can follow any responses to this entry through the RSS 2.0 feed. You can leave a response, or trackback from your own site.